While seniors may love to see children in costumes on Halloween night, the constant door knocking, masked visitors and unfamiliar faces can be intimidating. After all, 1/3 of all seniors who live at home, live alone - and most are women. 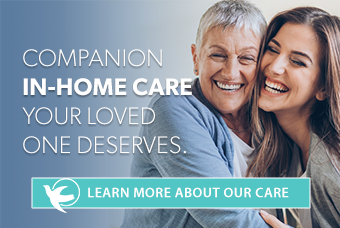 That's why Visiting Angels, one of the largest in-home care companies for seniors in the nation, offers seniors and their families a chance to hire a "Halloween Greeter" on October 31st. If family can't be with their senior loved one that night, Visiting Angels' "Halloween Greeters" can help seniors experience the fun (not the fear) of the holiday! Visiting Angels Halloween Greeters can help a senior shop for candy, help prepare seniors' homes for a safe Halloween, answer the door, help hand out candy to trick-or-treaters, and simply provide seniors peace of mind during the flood of front-door company. A Halloween companion for a senior helps deter troublemakers and gives the impression there is more than one person living in the home. Keep guests outside - never let an unknown trick-or-treater into your home to use the bathroom or make a phone call. -Leave your interior and exterior lights on during trick-or-treating hours even if you will not be home, or you choose not to answer the door. -While a dark home may signal to trick-or-treaters that there is no candy, it also tells vandals the house could be empty. Stay inside while handing out candy. And, if you have a door chain, keep it in place while handing out goodies. When your candy runs out, put a sign on the door that says "Sorry, No More Candy"
- leave a sign at the door that says "candy for this house is being passed out next door"
Make sure all floors, entry ways and porches are free from decorations. Remove any Halloween décor that involves flames, such as a lit pumpkin, from outside stairs and footpaths. This is a fire hazard for the dozens of kids stopping by with tails and capes. Place carved pumpkins outside to keep the smell out and bugs away. Add night lights to hallways, walkways and rooms. Avoid window decorations that block light or the view of the front entry.